When I’m knitting on something I’m usnsure if I’m going to like how the pattern or yarn is playing out I have a strategy. That strategy is to not cut the yarn at all. Hear me out because it’s smart and nuts at the same time. When I knit on Bolt I was not sure I was going to have enough, even though I was pretty sure I had enough yarn. So I would not cut the yarn until I was done with the project and in some cases after a certain amount of work I would cut the yarns as needed. This is a strategy I’m doing on the Joji mystery knit, not cutting any of the yarn which makes it very easy to rip out with no material waste or knots. But there is a downside to this, especially with more then two colors, your balls of yarn tangle a lot. You have to be very diligent about getting everything in order and making sure that they do not tangle. I have let them tangle a bit since there is a bit of knitting that needs to be done, but it still happens. I think at this point I’m happy enough with how it’s turning out that I will be cutting the yarn and weaving the ends as I go. Which will cut down on time spent after the project is complete and make blocking faster. But as it stands I have all five balls of yarn attached to this project right now and it’s a bit unruly. On the bright side, besides the colors being bright, it’s coming along quite nicely. I’m only working on one of the two pieces needed for right now. I want to get caught up on the clues before Friday when the next clue launches. But that might not happen, or it might depending on how much time I knit. That and making sure I don’t fatigue out my hands and arms in the mean time. On another note, my Love of Spiders is done, all blocked and ready to wear. It did grow a little bit which I did expect being 100% Mulberry Silk. What I did not expect was that it was going to be slightly asymmetrical, which might just have been an error on my part. Though I did keep the stitch count correct throughout the project, but might just be a weird thing with mine. I absolutely love how it turned out and my mother asked if I would make something for her out of the same yarn. I only have one more project worth of that yarn and it’s already designated for something else. So I might have to get more of it once the yarn embargo has lifted, whenever that is. But for now I will just have to enjoy what I have just made. By the way I am in love with how fast silk dries. I did wet block it Sunday around 4pm and by the time I checked on it at 2am it was dry. I will need to get some pictures of me modeling it when I have some time and when it’s daylight. Time to get back to the knitting of the mystery, lets hope I can make some good progress today. Alive and done, the Love of Spiders is completed. I am completely happy with how it turned out. I finished the knitting at my knitting group yesterday and I am super happy with it. I had some of my friends feel it and melt, I mean it is 100% mulberry silk after all. Even my mother felt it and kind of swooned a little bit and ask if it was for her. It’s for me, but I might let her borrow it ever so often. I haven’t woven in the ends or blocked it just yet, but thats for later today. But with it all done it freed up the needles that I needed in order to do the mystery knit along. But for now here is a pre-blocked look at the finished item. Looking pretty good if I do say so myself. You remember I said that I was going on a yarn embargo? That wasn’t that long ago, when I saw the state of the stash and decided that I needed to slim it down? Well I caved once again, but for a good reason. Well more of a justification in my head. This colorway was out of stock and I liked it quite a bit. So when I saw another ball on the shelf I wasn’t going to take chances and so I picked it up. With that purchase I earned a reward with the shop which I think I will buy one more skein of that yarn and resume the embargo. It’s Apple Tree and it’s beautiful. Also helps that I have a good lighting set up now. And I have some ideas for weaving from stash that I want to do, but I need to get a few different dent heddles for my loom first. More to come on that. The title is a little strange but keep reading and I’ll explain. Taking photos for the blog here, Ravelry, selling items, or whatever else can be a challenge sometimes. The set up that I have been using for a while now works, only when it’s daylight and certain times of the day. What I came up with to take my photos as a make shift light box is not the greatest by any stretch of the imagination. But the fact of the matter is that it works and has worked for a while. Though it has it’s limitations and I have worked around them. Right now as I’m writing this, the natural light coming into my space is good. It would be good enough to take some nice photos, with some touch ups needing to happen, the magic of post production. After a while this started to wear on me when I wanted to get pictures ready or get some things done before I would relax for the night. Which I sometimes would get the urge to do after I get home from work, which can be fairly late. By that time there is no natural light and I would have to rely on the electronic light that I have. Not the best for taking photos, with it’s warm, slightly yellow cast. A few days ago I had enough and decided it was time to invest in a good light box. One that I could pack up and set up really easily and didn’t need a whole lot of other things for it. I had one in mind for the longest time and I bit the bullet on Monday. Yesterday it arrived and I did some test shots of what I’m going to be talking about here. My initial impressions is that it is fantastic, exactly what I wanted. That leads me into this blog post, the light at the end of the box. So now that I have a proper set up and I’m on the border of my Love of Spiders, I thought it only fitting to take a picture of it. There are a lot of ends to weave in when I’m done, but I’m not really worried about it. I’m on the last section of the border right now and I am thrilled to have it done finally. Not just because I want to show it off and wear it (at some point), but then I have those needles back from a finished object. The Joji mystery is coming on clue 3 shortly so I will have to play a lot of catch up, but that shouldn’t be too much of a problem. Another benefit of having this done is that it’s a gauge swatch for something else. Yes I could have knit and blocked a swatch already and started the new project, but I wanted a real life item made with it to see how it behaves before I start the other. This way I have a finished object and a large gauge swatch in one. I think I’ve talked about that before, but I thought it would be good to re-iterate that point. 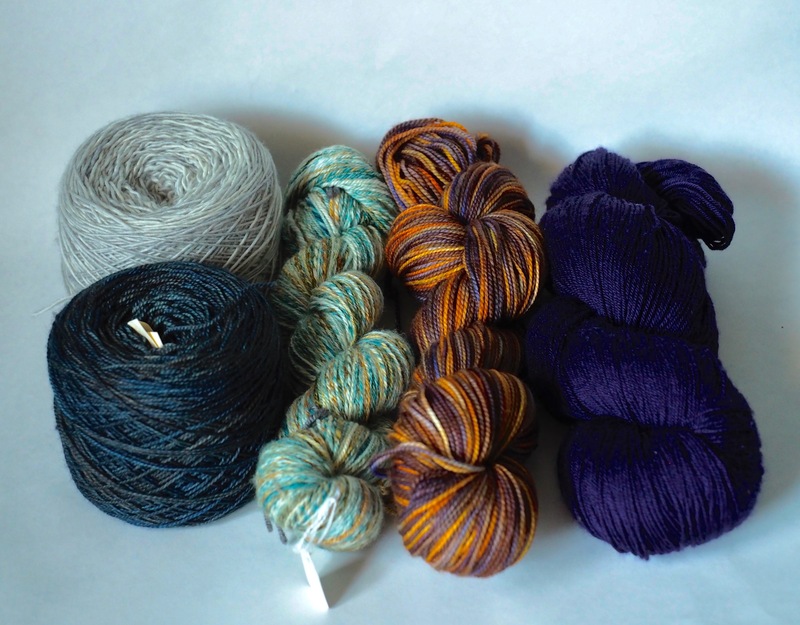 I’ve also chose what set of 5 colors I will be using, it’s the one without the handspun. But if all goes well and I really like the design I’m going to make the second option as well, because I think they both are fantastic. For now I think I’m going to try to get the border done tonight and blocked so it could be hopefully dry for my knitting group tomorrow. I do need to go through the stash more and get that uploaded. But now that I have a light box I can do that at any time. Back to knitting, to the light at the end of the tunnel and the box. I’m starting to wonder about my sanity with all of the yarn that I never put into my Ravelry stash. I went through just two bins yesterday and added in around 20-30 entries. That’s not even all of the yarn that I haven’t put, not even close. As I was putting yarn in I saw a sweater quantity that was sitting there and it took me a second to remember the brand. I looked in the stash and it was not in there. I had to stop at that point. I was a little baffled with the amount of yarn that I have that I haven’t added to the online stash. I’m going to have to be more diligent in the future and get myself caught up on finding all of the yarn. I think this will be a good spendinging deterrent. I will be going more and more hroughbthr stash, documenting it all in Ravelry and start looking st what I would like to destash. But after finding yarn and picking what might work I brought the yarn to my knit group. We all looked through what I had on Ravelry and what I had there and they helped me come up with 2 complete options. The only thing is they both have one yarn in common. But I have another skein of that color in a thinner weight. But I could always just double that one up if I wanted to do both. After seeing them both that’s what I’m thinking of doing. I’ll start with the first picture and if I like the design and the knitting I’ll make another. I guess we will have to see. But first have to free up a needle for this project. Just need to complete the last pattern repeat and border on my Love of Spiders. Remember I was talking about the mystery knit a long? Well I went through all of the stash and I couldn’t find the yarn I really wanted to use. And I picked out yarn that wasn’t good together. So I had to go through the stash again to find the right yarns. Thankfully I had looked through the stash and I knew of a few yarns that would work. I pulled the original yarn during the night so I didn’t have any natural light to look at the colors together. But that didn’t stop me when I picked them to say that these would be fine together. So armed with a white light and stash knowledge I went again through the stash. The yarn I wanted for this I couldn’t find for some reason but I still kept going. I remembered a yarn I bought at a LYS north of me and so I had to see if it worked. It looked good but I needed more solid yarns too to pull this off. So I kept diving and found some more solids and very subtle variegated yarns. As I dug through the stash again I kept finding yarn that I forgot I had. I kept finding yarn that wasn’t in my stash page on Ravelry. This made me a little concerned that I have more yarn then I thought. I think I’m going to have to go through all of the stash again and make sure I put all of it in. Maybe I’ll do that today. Regardless I found two combinations that would work. The four that are the same are Tosh Merino Light in Silverfox, Tosh Twist Light in (Looked at ravelry stash and it’s not there.. case in point) Spectrum, Lisa Souza Hardtwist Petite in Portsmouth, and Wollmesise Twin in Dornröschen. The two that would change are either Sanguine Gryphon Eidos in Siddhartha or some handspun Pigeonroof Studios in a colorway I have no idea I lost the tags. I think both would be a good match, but I’m still unsure. I’m going to have to take a look through the stash and see what else I can find. Option 1 with the Sanguine Gryphon yarn. I’m still thinking of what I want to do for the mystery. I want to see if I can find the yarn that I originally wanted and maybe make a better combination. Unless these are what I go for. I guess we will have to wait and see. For now I need to go through the stash and add everything that I have into Ravelry. Yikes. I might need to put things up for destash. No I didn’t spill anything, even though I’m quite a klutz. No this title references my creative juices flowing with my knitting. I have a lot of idea with all kinds of projects that I want to knit. I’ve been almost knitting on one project with a few exceptions for about a year. Things like the 36 Daisies (no I haven’t worked on it, it’s looking at me right now…) mean I would need something else to work on when I need a break from a complicated project. With all of these juices flowing I think I’m going to branch out to two projects at a time being worked on. This is due to projects that were set to the wayside that need to be completed and partially some of the projects that I want to work on. Bolt is done, blocked, and I’ve worn it. It’s fantastic, I think it’s the yarn that really gets me. 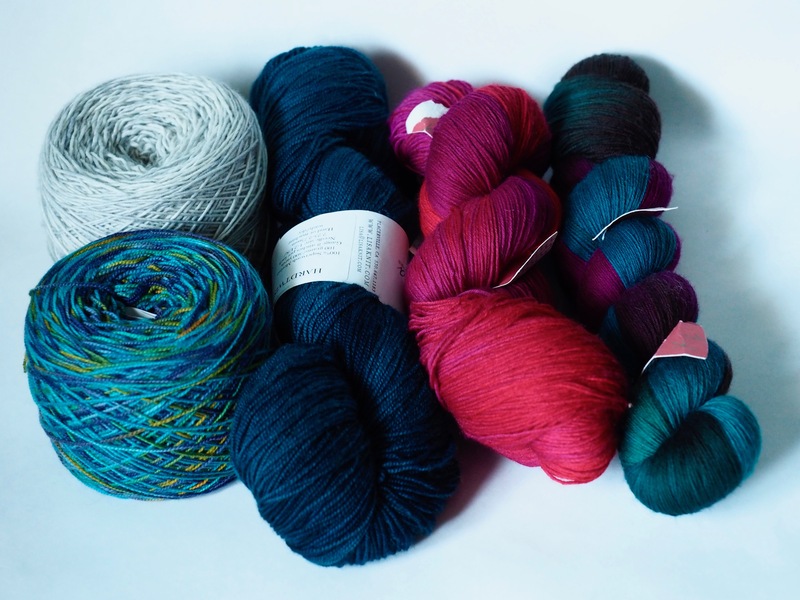 I can’t sing enough praises about this yarn, La Droguerie you have vexed me. Now that project is done I needed to get something else going. Well the pair of the Mind the Gap socks were being worked on as well. But this post comes with not one but two finished projects. Those socks are done and what can I say but they’re vibrant. They fit well, wish I did a little less short rowing on the heel but it’s ok. Washed and blocked now, they’re fantastic. They were an off and on again project, the first sock was knit on the way to London and Paris, and while in the UK. The second was all here at home. But it’s the memories that they bring when I see them. Now that I have those off the needles I needed to get something going again. I want to make something out of silk, a design. But I wanted to make sure I get the right fabric. So I needed to search, but even better a full project swatch. So I pulled out my silk The love of spiders shawl that went to the way side too. I’m now on the pattern before the border. It should block nicely but we will see. But that’s not the only thing on the needles. I got vexed by some yarn recently. My LYS got a shipment of the new madelinetosh colors and I found one i knew I had to make something with. After contemplation someone mentioned a pattern I made before. I dismissed it, because I didn’t want to make it. But then I thought about it and I gave that one to my mom. So then I made the decision to make this for myself this time, another viajante.